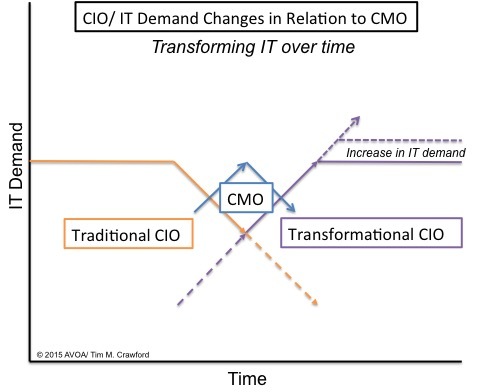 Three years ago, Gartner predicted that by 2017, the CMO (chief marketing officer) would spend more on IT than the CIO. This one prediction spurned a number of follow-up predictions pointing toward the end of the CIO. The bottom line that everyone wants to know: Is the CIO role indeed going away? Is another c-level function replacing the CIO? And if so, who will take over the IT function? It is not just the CIO and IT organization that are affected by a potential realignment of the IT function. Any change would have significant ramifications from people to vendors to architectures. No aspect of IT would be spared. If IT were to go away or otherwise move to a different organization (or organizations), it would have a significant impact on how we think, operate and support the IT ecosystem. The focus would move to the immediate problem being solved for. However, the CIO and IT as a whole carry a broader responsibility that spans the entire enterprise. The $64,000 question: What happens to the CIO & IT? Before answering those looming questions, it is important to see the trends that drove these predictions. Looking back, there is absolutely a decline in IT demand. Specifically, demand for Traditional IT is in decline. At the same time, the demand from marketing is stronger than ever. So, it makes sense that some of the waning demand may be transferred to marketing. Unfortunately, this only tells part of the story. If the story were to stop here, it would be easy to understand the logic behind the CMO taking over IT. 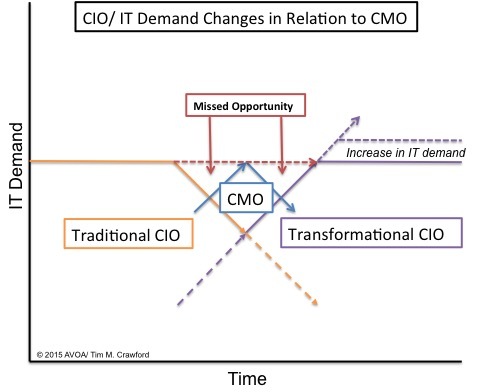 As demand for the traditional CIO wanes, the CMO picks up and carries the function forward. The reality is this is only a very small part of the overall movement underway. The transformational CIO, unlike the traditional CIO, is in high-demand. In many cases, organizations do not understand what this means or what a transformational CIO looks like let along what they are capable of. A transformational CIO, unlike traditional CIO, is far more aligned with the business of the company. They are in-tune with how the company makes and spends money. They also look for opportunities around customer engagement and business growth. Transformational CIOs are more about business and data than they are about technology. In many ways, the transformational CIO is a business leader (first) that happens to have responsibility for IT. Mapping the transformational CIO along with the traditional CIO and CMO brings the true picture into focus. One of the biggest challenges for transformation to take place requires all three components come together: The CIO, the IT organization and the rest of the company in terms of how they look at, leverage and engage IT. This evolution is referred to as the CIO’s Three-Legged Race. One unfortunate point to make is that few traditional CIOs will have the mettle to truly transform into transformational CIOs. It can be done, but requires a level of intestinal fortitude well beyond that of many CIOs today. Much of the change will come from the reporting structure of the CIO. Traditional IT organizations are often seen as a cost center and therefore report into the CFO. Transformational CIOs typically report directly to the CEO signaling the importance of IT (and the CIO) in leading the company. 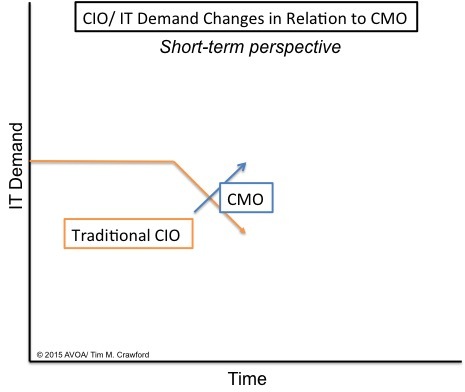 Consequently, a CIO reporting to the CMO may make sense temporarily, but not long term. The CIO’s prevue needs to be both broader and more strategic than any one function. Every CMO I spoke with is not interested in taking on the IT responsibility. They are today, because they have, not because they want to. Taking all of this into account, the role of the CIO is only starting to expand in ways it rarely has before. The same goes for IT. Sure, it may leverage a strong relationship with the CMO today. That is a very good thing! But it will evolve into a more impactful role that truly fills the qualifications for a seat at the CEO’s table. The entire concept of information technology having a C-level owner is passe. We keep attempting to succeed with this function in spite of the fact that it’s the most ridiculous role in the corporate hierarchy. Who doesn’t own information systems in the corporate structure today and who isn’t relying on information technology to provide some level of support? IT has become a bottleneck as everything passes through it and it was never designed to operate at that scale. I think IT should be broken into classes of service: financial services, analytics, customer support and experience, and industry-specialization (e.g. manufacturing, retail, etc.). Shared infrastructure should be managed by an infrastructure-as-a-service group. The sooner we stop attempting to be successful with an afflicted model, the sooner we can develop IT services that are designed for an agile purpose. I would agree with that when considering traditional IT organizations. Transformational organizations are capable of not only handling the challenges you’ve outlined, but able to take a leadership position at the c-level. I agree JP. IT has become very centralised in the core of most organisations as a ‘shared service’. As such is not best placed to provide transformational services. Innovation – the motivator for transformation – happens at the edge of the organisation where all the raw information exists in real time… not the CRM system. The edge is where the CMO, Director of Sales, Head of Customer Services, Product Development etc all sit. Some key technologies are absolutely pressuring traditional IT. BYOD is a classic case of the users taking over… at the expense of IT through loss of authority and power to influence. Many a CIO I work with asks me ‘what do I have to do to get back control’… its the wrong question. Justin, great points. I would argue if the CIO is asking ‘how to get back control’ they are probably not the right person to do so. However, the CIO role (transformational, not traditional) is very relevant today and only increasing in demand.